Runners will be required to pick up the specially designed, commemorative bib with timing tag, turkey-themed long sleeve technical participant shirt and other event material during the designated Packet Pick-up times. Runners must show the E-card at Packet Pick-up either printed out or displayed on a phone. On Friday, November 22 from 7:30 a.m. and 7:00 p.m. at Fowler Hall, the Marine Corps Marathon building. Runners are encouraged to attend Packet Pick-up prior to event day. However, packets will be available event day from 7:30 - 9:30 a.m. at the Info tent. For runners unable to attend Packet Pick-up on Friday, November 16, a designated representative may obtain event materials with proper documentation. The individual picking up the bib for a registered runner must present a hard copy of the completed E-card with a copy of the runner's photo ID, as well as a copy of his/her ID. Please obtain the runner's preferred shirt size. E-Cards are emailed to the registered runner before the event. Parents may sign waiver and retrieve packets for children under 18 years of age. Proxy pick up is only available Friday, November 22. Marine Corps Marathon World HQ (MCMWHQ): Fowler Hall, 3399 Russell Road, Quantico, VA. If using a GPS, enter 3400 Russell Road, Quantico, VA.
Exit 148 from I95: From North, make a left at the light to enter Base. From South, you will make a right at the light to enter Base. Be prepared to show photo ID at security gate. MCMWHQ is the first building on the left before the Commissary and Exchange. Hint: If you drive past the McDonald's, you've gone too far. Exit 150 from I95: From North, pass the National Museum of the Marine Corps on your right and cross Route 1 to reach security gate. Be prepared to show photo ID. Make a right turn onto Purvis Road. Road curves around the Marine Corps Exchange. At the light, turn right onto Russell Road. Turn right into the MCM lot, after the Commissary and Exchange. MCMWHQ is the last building on the right. Hint: If you reach the guard station, you've gone too far. The recipe to run the Turkey Trot includes two course maps, a side of parking and a dash of road closures. 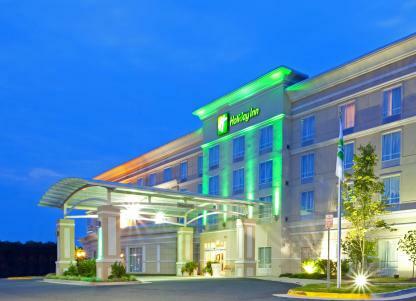 Minutes away from Marine Corps Base Quantico and the Turkey Trot course, the Holiday Inn Quantico Center is dedicated to help make runners' stay unforgettable. See runners chase through fall foliage in pursuit of frozen turkey and pumpkin pie awards.